Editor-in-Chief Dsc., Associate Prof. Ihor Karivets', Lviv Polytechnic National University, Ukraine (ihor.v.karivets@lpnu.ua). 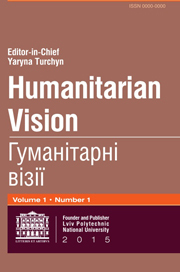 Deputy Chief Editor Dsc., Prof. Yaryna Turchyn, Lviv Polytechnic National University, Ukraine (turchynj@ukr.net). Ph.D., Associate Prof. Olesya Pankiv, Lviv Polytechnic National University, Ukraine (olesya.pankiv@ukr.net). Ph.D., Associate Prof. Ruslan Demchyshak, Lviv Polytechnic National University, Ukraine (ruslan.dem74@gmail.com). Dsc., Associate Prof.Mykola Buchyn, Lviv Polytechnic National University, Ukraine (buchyn@ukr.net). Dsc., Prof. Larysa Klymanska, Lviv Polytechnic National University, Ukraine (larysa_kl@ukr.net). Dsc. Prof. Halyna Lutsyshyn, Lviv Polytechnic National University, Ukraine (l_halyna@ukr.net).